Bixby – Samsung's answer to Apple's Siri – hasn't made its official debut yet, but it seems the on-phone digital assistant may already be overstaying its welcome for some users. It appears that Samsung has blocked the ability to remap the dedicated Bixby button on the yet-to-be-released Galaxy S8, ensuring the button remains exclusively for calling up the digital assistant, according to a report from XDA Developers. While Samsung seemingly never intended for the Bixby button to be customizable in the first place, third-party developers were able to change what it could do, assigning it to functions such as launching the camera or Google Assistant instead. Following a recent update, however, this ability has now been removed, with a Samsung representative confirming in a tweet that button remapping was "exploiting a system-level behavior", and will not be an officially-supported function for the foreseeable future. 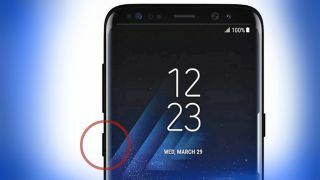 This means that unless Bixby really takes off, future Galaxy S8 owners may be stuck with a button that could potentially go unused – especially when you consider that Bixby won't even get voice command functionality at launch. It also feels like a missed opportunity, as giving users the option to map their favorite app or feature as a shortcut could easily help the S8 to stand out from other major smartphones on the market. Then again, having a dedicated, permanent button for Bixby on the S8 also increases the chances that it'll actually be used when the phone launches, but that's just us speculating. The Samsung Galaxy S8 hits the US on April 21, followed by the UK and Australia on April 28. It's priced at from $720, and at £689 / AU$1,199, SIM-free, although a fully unlocked option won't be available in the US until a month or more after the initial launch.